Coming up to Easter, I want to use eggs. Eggs are so useful and versatile. They bind, they expand, they emulsify. They come in two parts, yolk and white, can be eaten raw or cooked, can be used in sweet or savoury recipes. Eggs were used by medieval painters, tempera, as paint. The shells can be used around plants to deter pests. 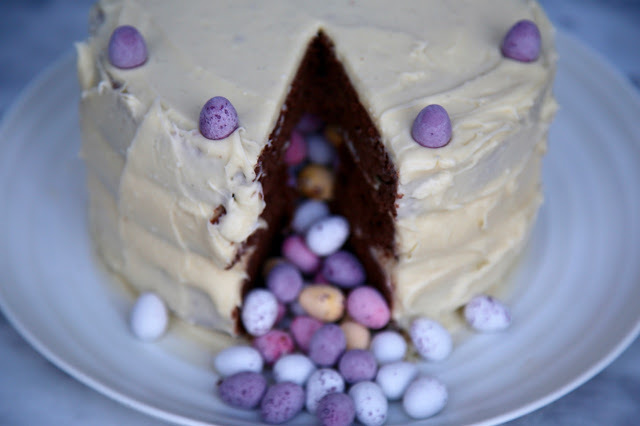 This Easter I’ve created an egg chocolate ‘pinata’ cake (which can easily double as a birthday cake). 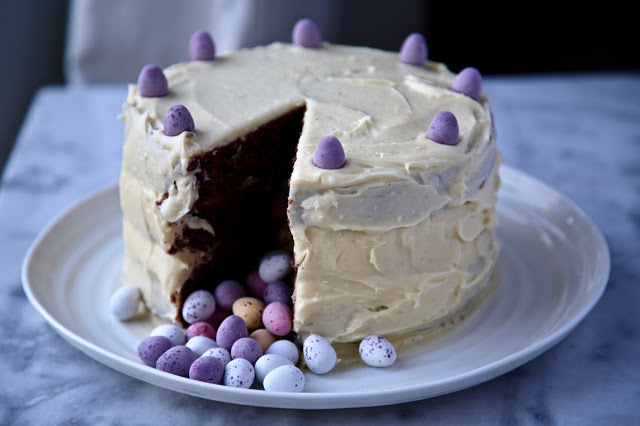 For the cake I’ve used duck eggs, higher in fat and 50% larger, promising a beautifully light risen sponge. Prepare your sandwich tins (buttering or using a cake spray release). 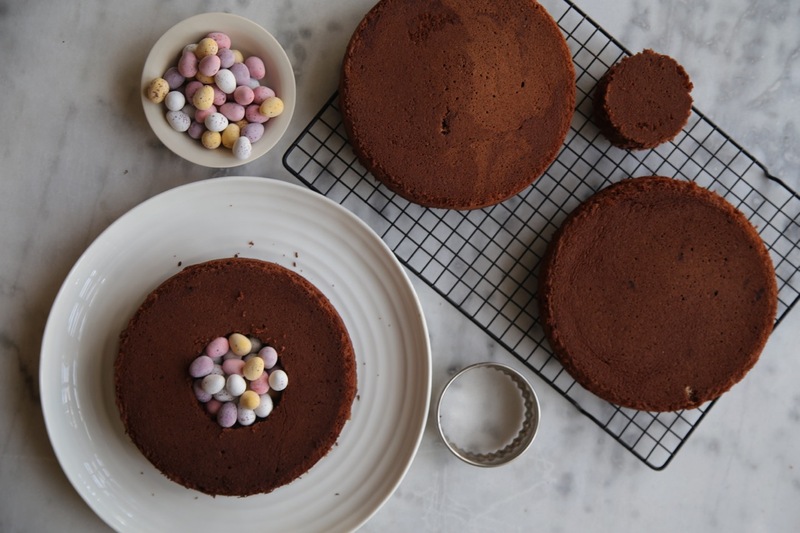 If you only have two, you will have to make the cakes in two stages. Scrape down the sides of your bowl then add the eggs one by one, combining between each addition. Add half the self-raising flour, stir in. Then add the second half. Divide the mixture evenly between the tins. Bake for 30 minutes or until springy to the touch. You can also insert a skewer, if it comes out clean, the cake is baked. Leave the cakes to cool in their tins on a rack. Heat the cream in a small pan. Put the white chocolate into a heat proof bowl. Add the warm cream to the white chocolate and stir. In another bowl or stand mixer, beat the butter, vanilla and icing sugar until fluffy. Pour the cream/white chocolate into the the butter mixture. Combine and let it cool. Using a cookie cutter, cut out the centre of two of the sandwich layers. Place the 1st cut-out layer on a flat plate or cake stand and, using a palette knife, spread the frosting over the top. Place the 2nd cut-out layer on top of the first cake. Fill with the mini eggs until level with the top of the 2nd cake layer. Frost the top of the 2nd layer and place the 3rd cake layer on top. Then apply a crumb coat, which is a thin layer of base frosting, all over the cake, starting with the sides so that you can turn it around while holding the top. Chill the cake in the fridge for 10 minutes or so. Then with a palette knife, thickly spread another layer of frosting. 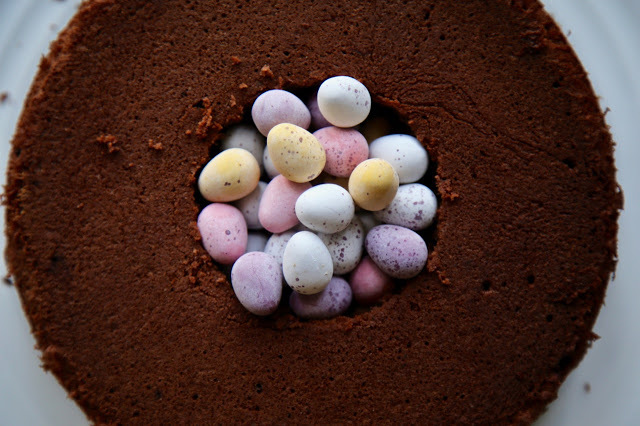 Decorate the top with more mini eggs if desired. Great recipe to follow and such an easy set of ingredients. Love a low labour showstopper! 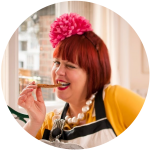 Particuarly looking forward to the 'cook's treats'. 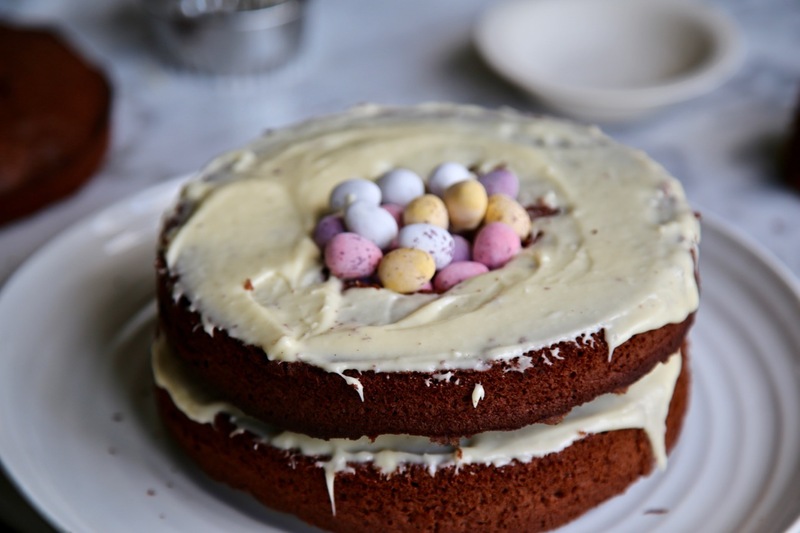 Those cut outs slathered in icing so easy to stuff in guilt-free! The recipe really is very simple. The icing was so more-ish. A yummy treat for Easter 🙂 Kids are gonna love this. Easy to prepare and quick to grab!